Aluminium and its alloys are highly resistant to atmospheric corrosion: the pure metal and many aluminium alloys can often be used without protection. Aluminium has a great chemical affinity for oxygen, and a film of oxide forms spontaneously on any surface exposed to air. This film is very stable and protects the aluminium from further attack. Resistance of individual aluminium alloys is determined mainly by their composition but is also influenced by heat treatment. Aluminium alloys in the T4 (bending) condition being more resistant than those in the T6 (fully hard) condition. Exposure of the bare metal to any atmosphere must, after a period that will depend on the circumstances, impair its original lustre and smoothness. In severe conditions surface deposits and slight pitting may appear. The corrosion resistance of aluminium can be increased by the application of an anodic film i.e. by anodising. Special precautions are often necessary when aluminium alloys are likely to be in contact with other metals. 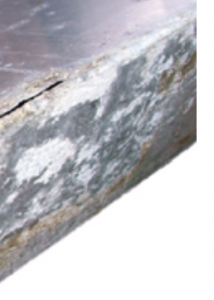 It should be noted that problems could occur in the combination of galvanised steel and Aluminium. This is due to the fact that the coating of zinc will protect the Aluminium but when the zinc is used up the bare surface of steel can attack the Aluminium. For this reason the Aluminium should be combined with warm zinced material in an aggressive surrounding because warm galvanising, gives a harder coating of zinc, than hot-dipped.